Pen/Knife/Laser Black | BUDK.com - Knives & Swords At The Lowest Prices! As an executive of a company, you always need a pen and a laser pointer, and as a man, you always need a knife. Well, now you've got all three in one compact package. 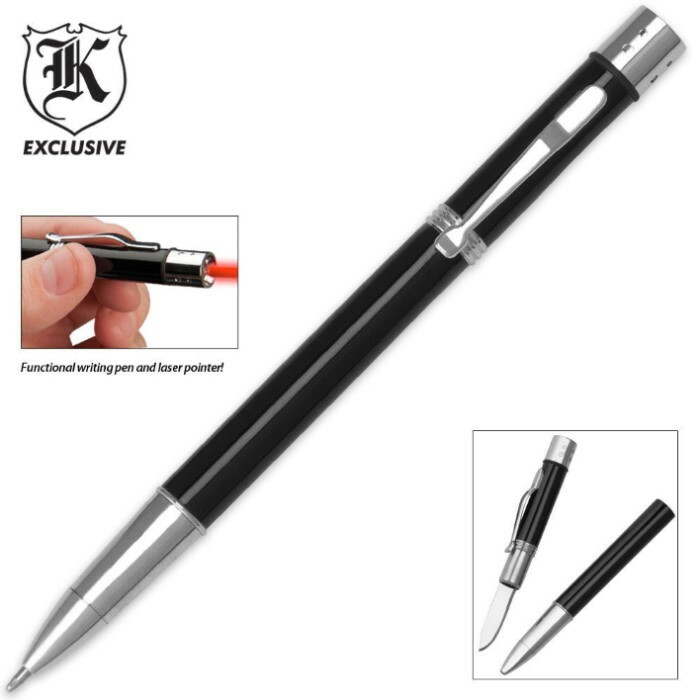 This pen actually writes and the laser pointer works like any other, so now you can direct the meeting and then write a check, and even use the 1 1/4" knife blade whenever you need it by just pulling the end off the pen. It's the perfect tool for the workingman. I ordered 2 of these, they are made quite nicely for the price, knife isn't the sharpest but it will be handy for opening boxes/packages, however one of them did not want to write, I tried for 10 minutes, finally gave up, contacted BUDK, and they sent me out a new one, which works fine, thanks again BUDK! The knife is pretty small but the laser works great and has plenty of distance for something so cheap. The only issue is with the pen, the ink cartridge got knocked out of the setting so it can't write and I haven't managed to be able to get it put back in correctly due to how narrow the tube is.